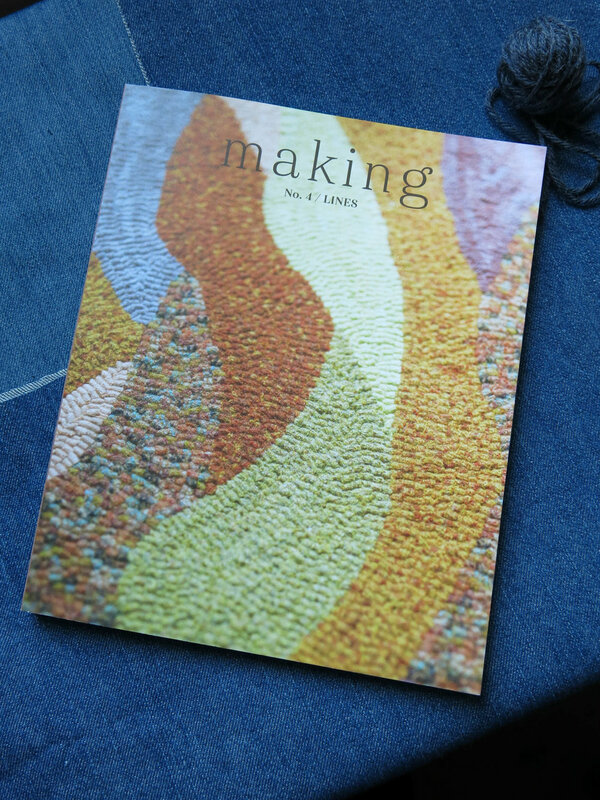 I am very happy to share with you that I have a small mending project in the newest issue of Carrie Bostick Hoge's magazine Making, Lines. I am very proud, locally speaking, of Carrie and this publication, being produced here in Maine. So when I was invited to participate, I jumped at the chance...! I taught a Visible Mending workshop at AGOS when we were in Portland, and loved showing people how to prolong the life of their well-loved garments. I do not profess to be anything like an expert at this, I bow down to Katrina Rodabaugh and Tom Van Deijnen, or Tomofholland as you may know him, who are masters of mending. But along the way I have mended more than a few of Don's pairs of jeans. In fact I noticed the other day that he has sprung some more leaks.... I am practiced at the craft of mending jeans certainly. The tutorial is a simple straightforward way to fix holes in your favorite jeans. It was a lot of fun to work with Carrie on the shoot, I did the mend and she photographed it as I worked on it. It was a warm sunny day in her studio and I did some silly gymnastics to make the fix accessible to her lens. It was a sweet afternoon. I have been a subscriber to Making since Carrie launched it. It is a wonderful collection of knitting projects (natch) plus sewing projects, and some selection of embroidery, rug hooking, crochet, and kids projects, plus recipes, and essays on making, and more! It's always a lovely cross section of craft. Something for just about everyone. Since I am a subscriber, I have two copies of Issue No. 4, Lines. I love this publication so much, I thought I'd share my spare copy with one of you! It would be a waste for this copy to sit here in my studio when it could be out in the universe spreading the joy. Leave me a comment here about your experience with, or interest in, mending and I will pick someone at random on Thursday afternoon at 3:00, 10/ 19, before I head out to Rhinebeck. And then you should go subscribe to Making! You can buy back issues, there have been three and I highly recommend all of them.... Carrie is joining forces with Ashley Yousling of the Woolful Podcast, so there are all sorts of cool things coming from these two talented women in the future....! You don't want to miss out on any of it.